Italy's newest hero is Capt. Francesco Iavazzo, whose quick thinking and efficient crewmen saved the lives of literally hundreds of migrants whose shabby boat with 600 aboard capsized off the Libyan coast. "At sea, safeguarding human life is a sacred task," said Capt. Iavazzo. ROME -- Italy's newest hero is Capt. 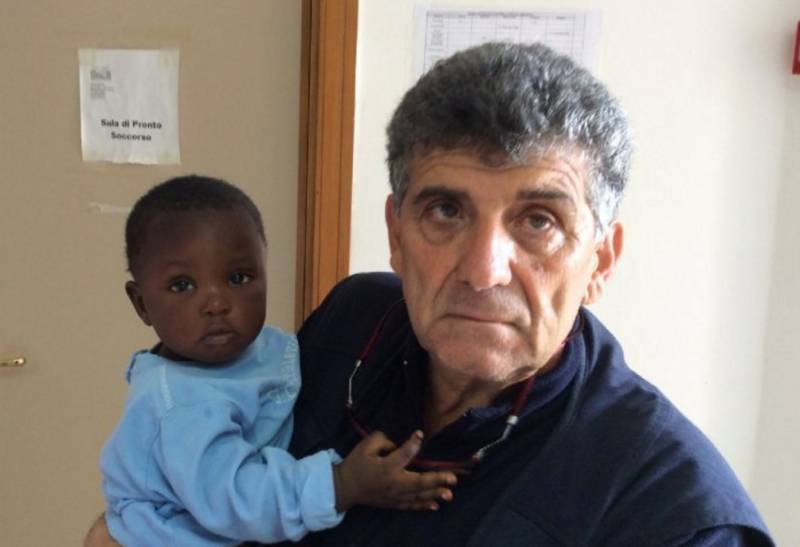 Francesco Iavazzo, whose quick thinking saved the lives of literally hundreds of migrants when their shabby fishing boat with 600 aboard capsized off the Libyan coast. "At sea, safeguarding human life is a sacred task," said Capt. Iavazzo. Almost needless to say, he gave all credit to the sailors on his ship, the "Comandante Bettica," one of Italy's seven new logistic support vessels that prowl the Mediterranean. Equipped with a helicopter landing port, the official role of the "Bettica" is to protect Italian fishing boats and petroleum platforms. Some 240 people had been brought to safety when panic overwhelmed the remaining 350-some passengers. Shifting, they overturned the rickety fishing boat, which threw all those still on board into the water. As it overturned, passengers slid down the deck on top of those already in the water. Nevertheless, in the end, thanks to the quick response of the Italian navy, 341 men, 48 women and 43 children -- some yanked out of the water by their hair -- were brought to safety, for a total of 432 people. Most appeared to be sub-Saharan Africans and Syrians, who probably boarded their boat in Libya. Once aboard, the migrants were given hot tea and blankets, and the children soft teddy bears they hugged. "Health screening is very important -- we have qualified personnel on board down to and including services of an obstetrician," he said. "At sea safeguarding human life is something sacred." One of the saddest moments: learning that the mother and father of a nine-month-old baby girl, Favour, had drowned before the infant was successfully rescued. This was hardly his first major rescue operation. In a TV interview some months ago a visibly tired Capt. Iavazzo spoke of recovering another overcrowded rubber boat just 20 miles off the Libyan coast after it had been spotted by the Royal Navy, which launched an SOS. Official figures are devastating. In July of 2013 over 400 drowned off the coast at the isle of Lampedusa, visited in October by Pope Francis. In 2014 the official tally of those known to have drowned in the Mediterranean had risen to 3,279; in 2015, 3,771. This year, with the influx soaring as the route through Greece is blocked, some 3,000 arrived in a single day last week and another 3,000 one day this week; accordingly the number of those drowning at sea will continue to surge. As one fisherman remarked sadly, "There are now more cadavers than fish in the sea." What is to be done? All told, in 2015 one million people reached Europe. Last April Premier Matteo Renzi appealed to his European partners, "Do not leave us alone." In the wake of this newest disaster he announced that the next meeting of the G7, on this occasion under Italian direction, will take place in Sicily either at Lampedusa or Taormina, and that migration issues will top the agenda. The obvious problem is that, with political populism on the rise, as in France, the mainstream politicians fear that any defense of migration puts their own political future at risk and boomerangs by fostering more resistance.